The Vita Cabaret is in the 700 series luxury hot tub range from Vita Spas featuring a sports recliner and couch for two people. A unique design, perfect if you need to combine the hydrotherapy benefits of a hot tub for sports recovery along side practical and fun use that includes a vertical back massage jet and a couch for 2 people. 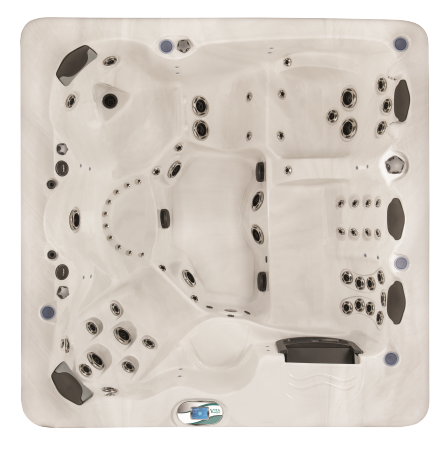 This unique and innovative design offers a great wealth of benefits enabling your large 7 seat hot tub to provide more than just the standard benefits. The sports couch is designed to relax all areas of the body combining targeted jets for the arms, wrists and shoulders along side back, calf and thigh jets. Designed to improve recovery times from general sports as well as aiding sports injury recovery, the Cabaret is great if you need a sports therapy hot tub combined with a fun and luxury hot tub for a large family. Built to a high specification including a steel frame as well as circulation pumps that operate 24 ours a day, the Cabaret also has a range of luxury features that you would expect from the 7 series. From the150W subwoofer linked to the surround sound music system to LED back lit fountains and coasters, there is a fantastic range of additional features that all add up to make this one fantastic package. The Cabaret sports and hydrotherapy luxury 7 person hot tub is available to buy with a delivery and installation service from Bay Spas covering the south west and Cornwall and Devon.